Affirmations are statements that you repeat until they become new beliefs. They can be used to eliminate negative thinking and to create situations that help you achieve your goals through the Law of Attraction. You can’t use affirmations to change someone else’s behavior, only your own. So, if you’ve been using affirmations like, “My children listen to me” or “My boss promoted me,” without success, now you know why. 1. Are connected to you, your behavior, and your goals. Your affirmation should focus on what you want to have happen and what you can do to obtain your goal. For example, “I am now saying the right things for my children to listen to me” or “I know what to say to get my children to listen to me and I am now saying the right things to get my children to listen to me.” In these examples, you have informed your subconscious mind that you need to say the right things to change the situation, you are saying them, and you are incorporating your goal of having your children listen to you. 2. Are simple. Affirmations should be simple and easy to remember. Otherwise, it’ll be too easy to make excuses for not saying them, or to simply forget about them. 5. Are filled with emotion. The more positive emotion you put into your affirmations as you say them, the faster you will see results. When you say your affirmation, really feel it. Get excited. Allow yourself to fill up with positive emotion. This becomes even more important the longer you use the affirmations. In the beginning, they are exciting and new. After a while, it can feel like you are just saying them to say them. To keep your energy high, track your results, making note of any changes in your life or beliefs since you began using them. 6. Require repetition. You can choose to either repeat the statements to yourself as often as possible during the day, read them a couple of times a day, record them and listen to them while driving or throughout the night as your sleep, or even write them down 15 times every morning, noon, and night. 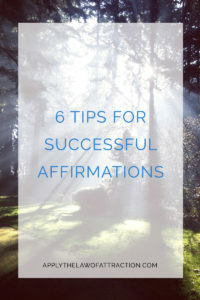 Do you have any other tips for using affirmations that you’d like to share? Let me know in the comment section below. If you want more information on affirmations and the Law of Attraction, check out the pages below. This is great! I am putting together affirmations to stop worry. Can you offer me a few suggestions on how I can word it? Follow the affirmation tips in this article and you should do fine. It gives the key elements on how to word things. Just focus on how you want to feel instead, such as at peace, calm and confident. There are also multiple lists of affirmations you can search for on this site to get more ideas.